Continuous Ink System: You can search these on ebay. You will need the type of printer that has 4 different, individual cartridges. Above is a picture of mine. They do make continuous ink systems for the tri-color cartridges, but my feeling is that it is not a good system. With the tri-color, the ink cartridge itself moves back and forth inside the printer, making it difficult for the thin tubes feeding the ink supply to be mobile and work well. 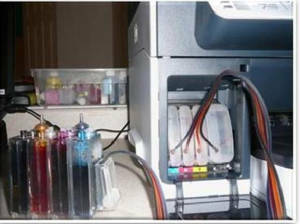 With the 4 color system, the ink cartridges themselves do not move (the print heads inside the printer move) and thus the ink supply tubes are stationary and it is a much more reliable system. I have 6 of these printers (I like the HP Officejetpro L7500 series) with this setup and have no trouble at all with them. I have been using this for 3 or 4 years. They no longer make these particular printers, but they can still be found on the internet. I have used others, but like this one the best. If you want a printer that is made currently, I would search available CIS (continuous ink systems) and find the matching printer, rather than finding a printer and then look for the CIS. Where to purchase? My first choice is always Ebay. The prices are most competitive there. You will probably pay somewhere between $39 and $80, depending on the model. For the refill ink, I now sell it on my website. Please search the catalog section. This is the printer I bought and I LOVE it. Wireless and has a 30 page document feeder which I am loving. You can print pics right from the printer(not through your computer) using your card and the touch screen. I got mine for a steal at Office Depot for 129.00 but it was a printer recycle day and I got $50 off on top of the sale price. I have watched and $179.99 is the lowest sale price I have seen barring that. I like to shop Office Depot to accumlate Star teacher points. This is the CIS I finally bought with it. It was super easy to install. I didnt have to remove anything to put it in. You can watch a video on youtube of how to set it up. They have an alter option and a no alter Opt. I didnt alter my printer at all and it works great. Printing quality is still good. I just printed a large quanity of syllabi for a class I am teaching and the quality was consistent throughout.I have only had the CIS for 3 weeks, had the printer since hmmm March or February. So it took that long for the cartiages that came with to run out. I am very happy. It is so worth every penny. Piano book CISS from printpayless Epson Artisan 800 810 710 700(Non-oem) CIS System for $46.95 through Amazon.